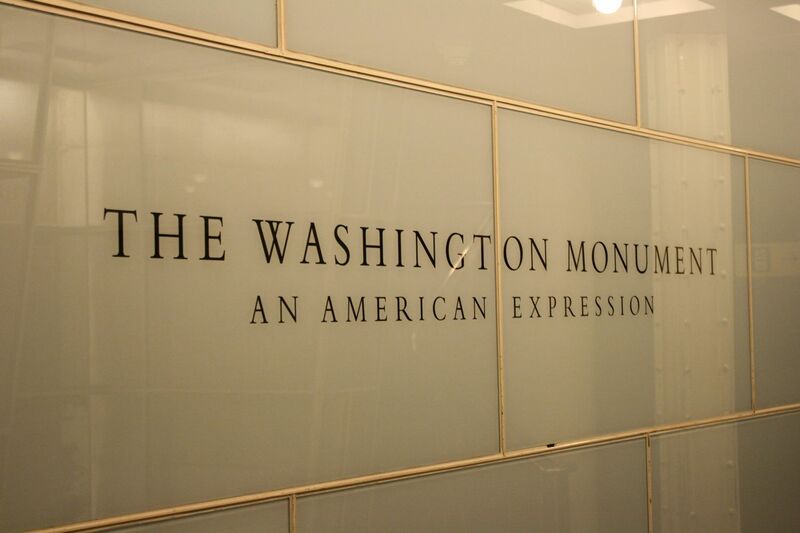 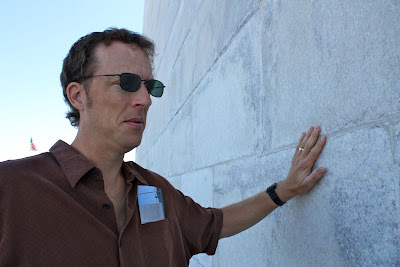 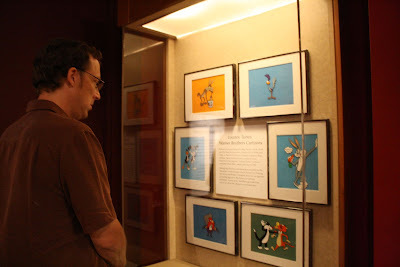 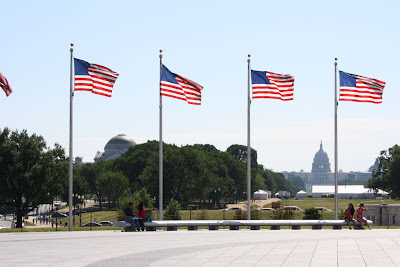 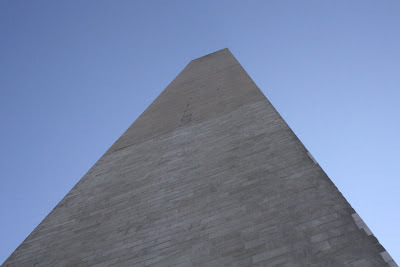 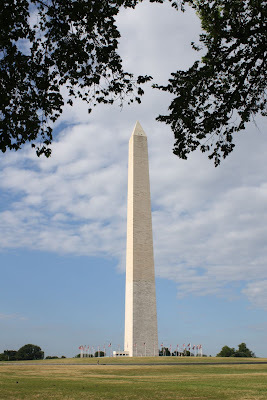 See-Dub: Vacation 2010: DC - Washington Monument and Museum of American History. 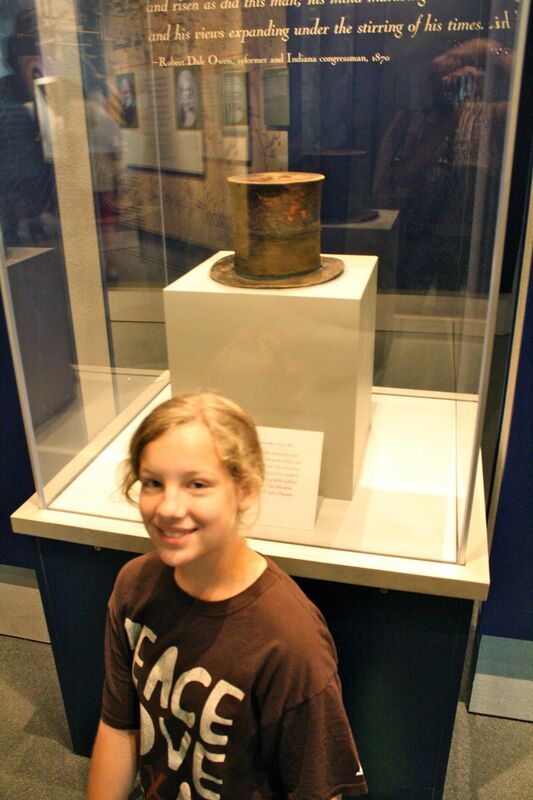 Vacation 2010: DC - Washington Monument and Museum of American History. 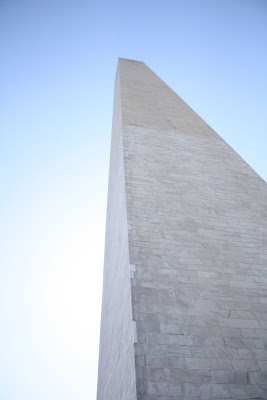 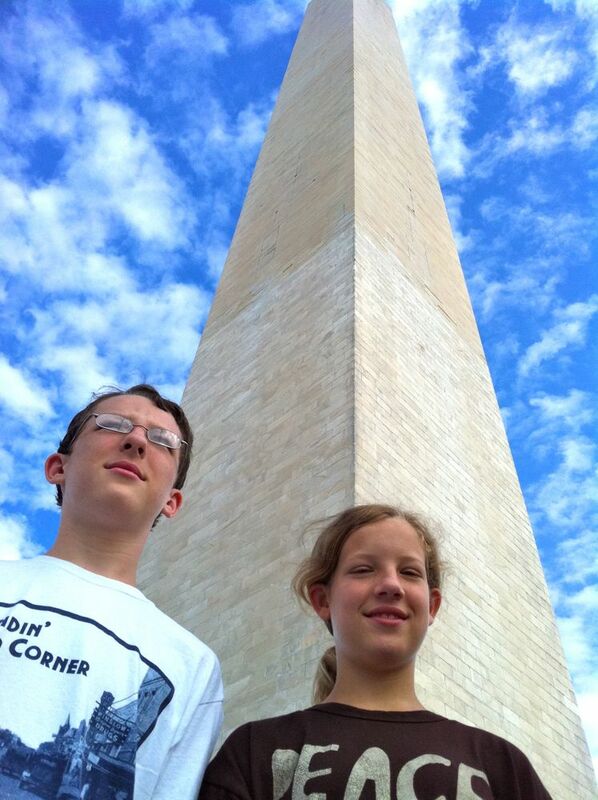 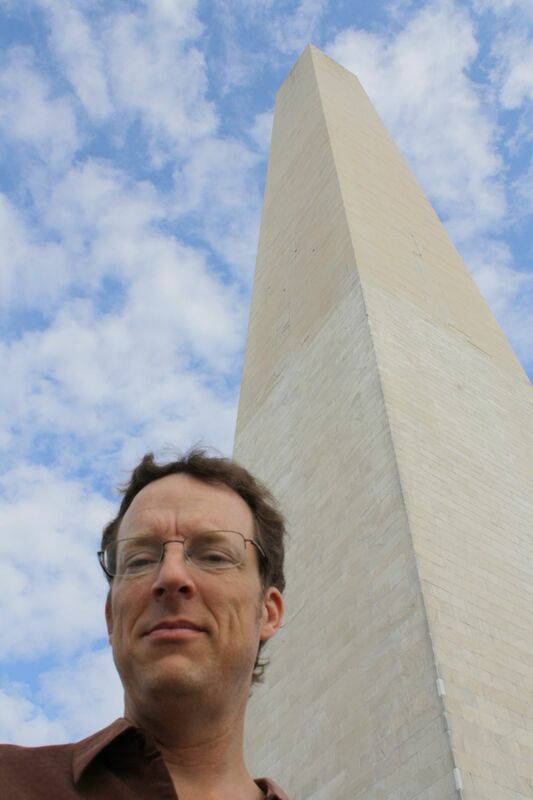 At 9 a.m. that Sunday morning we had a date with the Washington Monument. 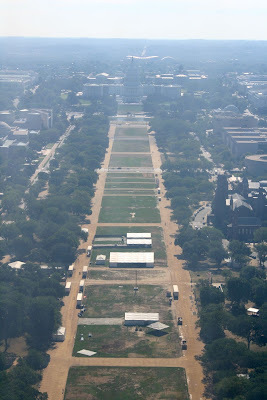 Once again, online ticketing saved us from a massive line at the ticket window, which opened at 8:30. 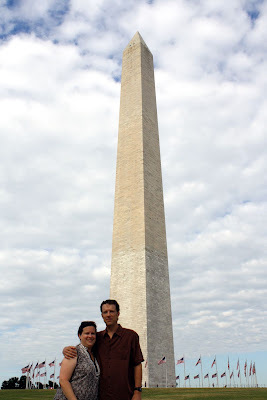 Instead of waiting, we could take a nice stroll around the monument and take bunches of pix. 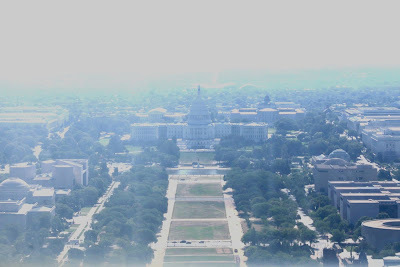 I know I just posted another picture very similar to this one, but isn't it cool how the sky cleared? 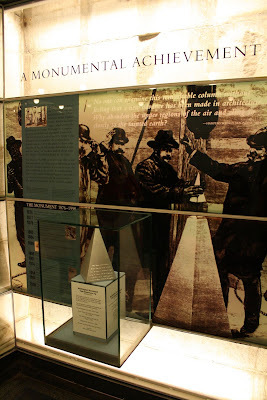 Once inside the monument, we made our way around the inside perimeter to the elevator. 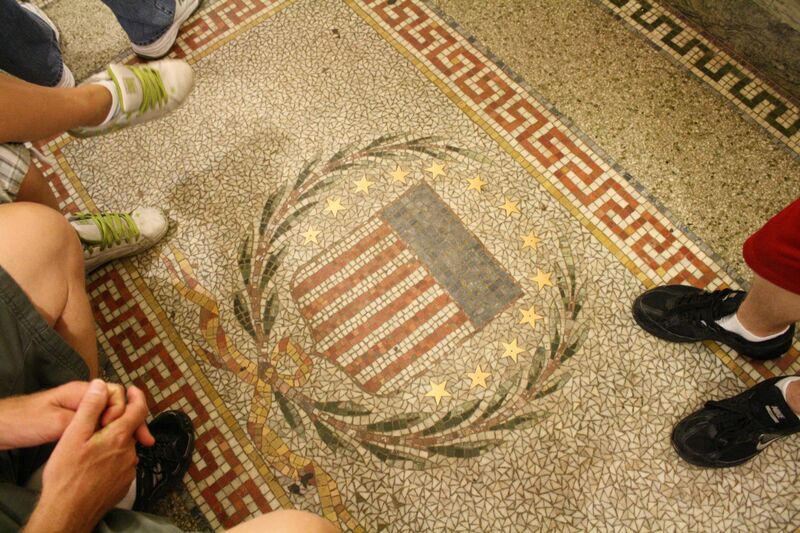 I was impressed with the mosaic floor. Finally we got our turn to gaze through those windows at the top. And wow, was it worth it. 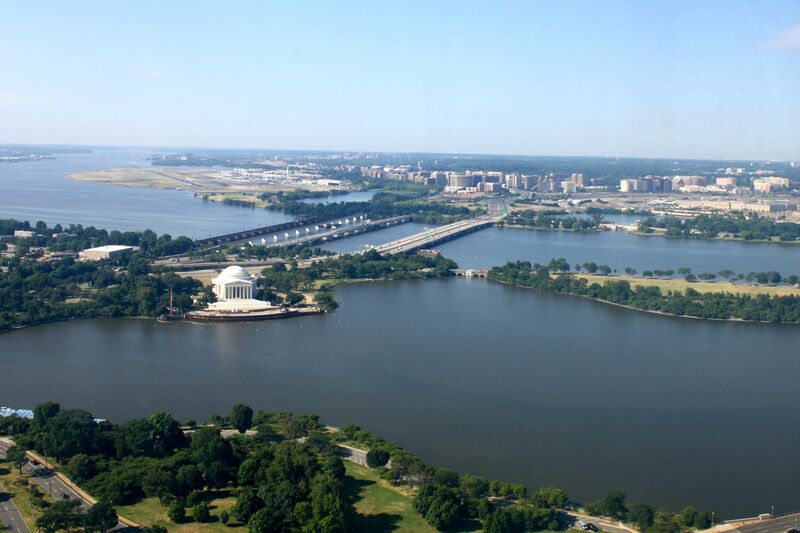 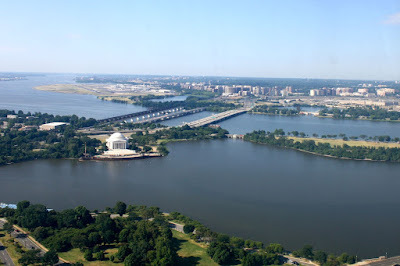 I loved this view of the Tidal Basin and the Jefferson Memorial. 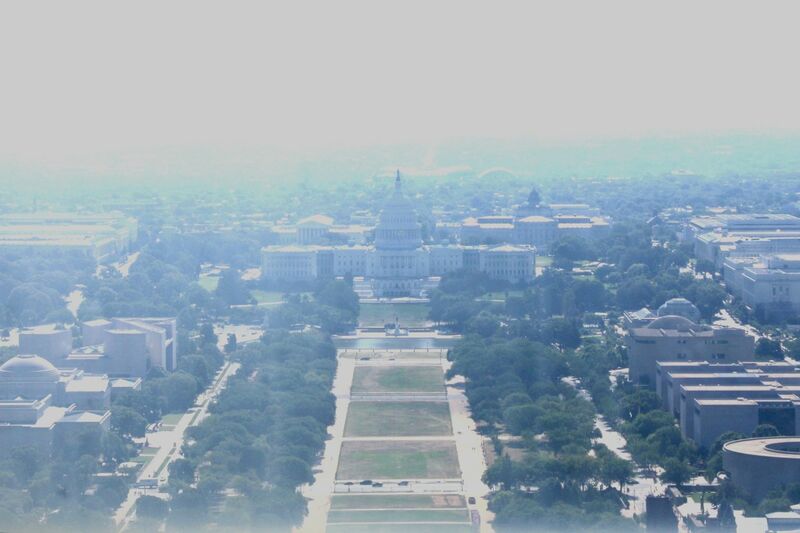 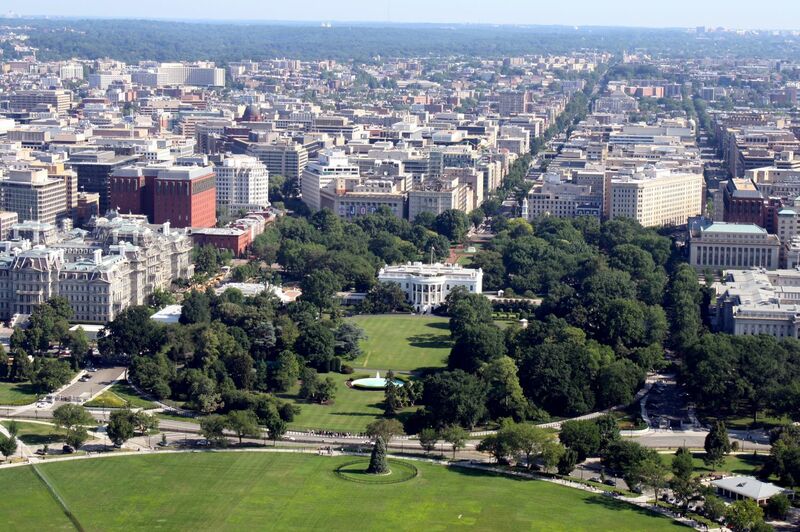 Sadly, this is as close as we ever got to seeing that part of DC. 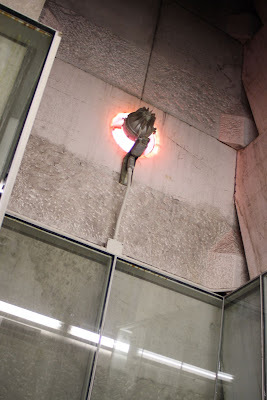 Nerd that I am, I also got a kick out of seeing the little red lights at the top. 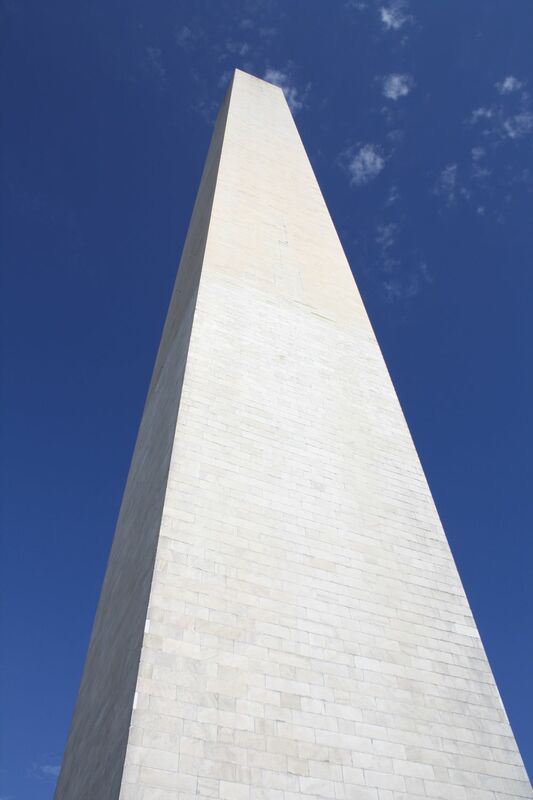 I've seen countless images of the monument at night, and those aircraft warning lights at the top always seemed like eyes to me. 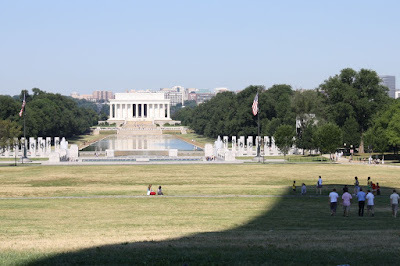 We spent a good deal of time taking in this view of the Lincoln Memorial since we had walked to it a few days earlier. It was nice to see the reflecting pool this way: high enough up that we couldn't see—or smell—the goose poop! 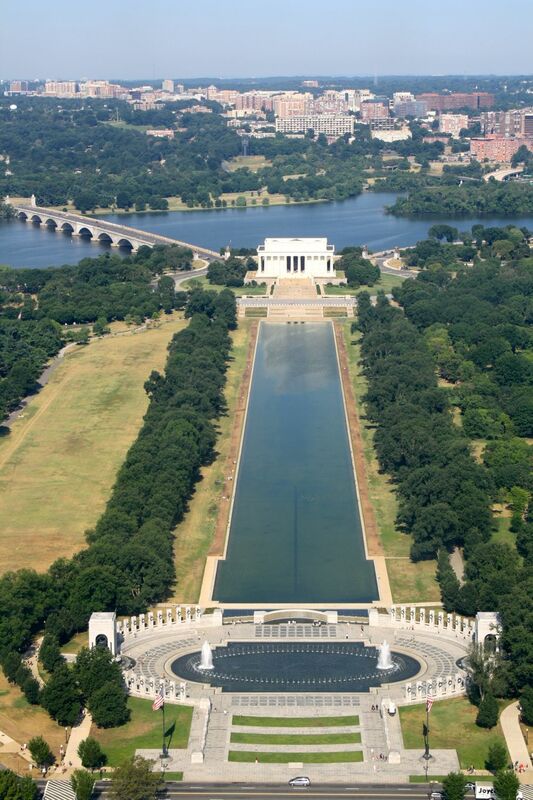 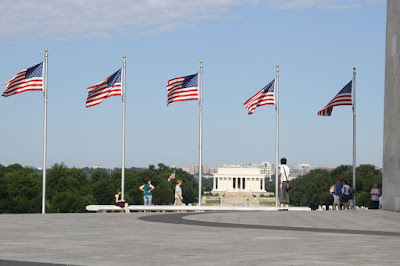 Some may disapprove of the World War II memorial's placement, but its symmetry fits with the other structures' design. 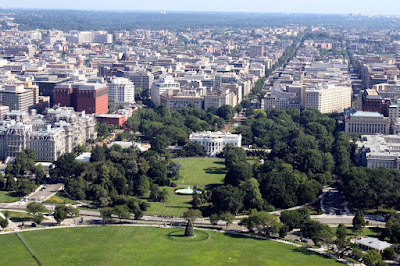 To the north we had this great view of the White House. 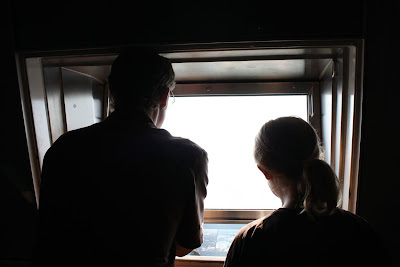 Each window had maps or diagrams to help us figure out what we were seeing from that height. 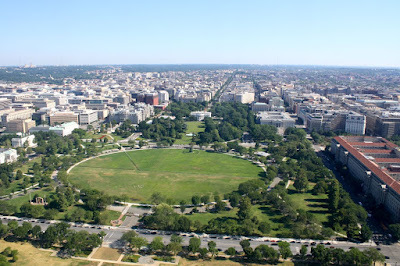 This one showed several incarnations of the ellipse. The only bad thing about our early visit to the monument: the crazy glare to the east. 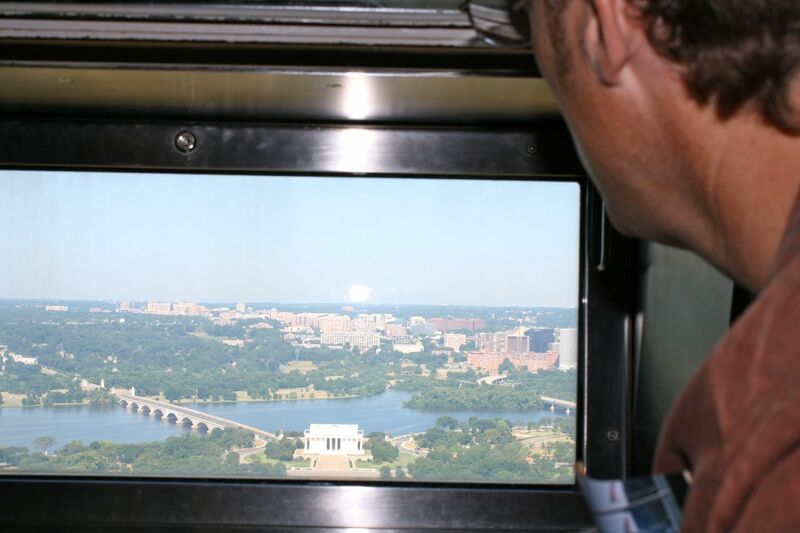 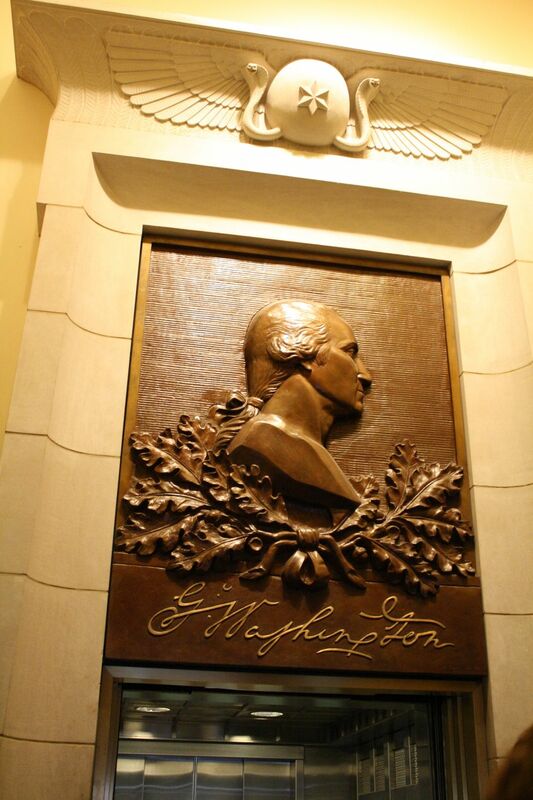 Upon leaving the observation area, the elevator drops guests off at a lower floor to see the exhibits. 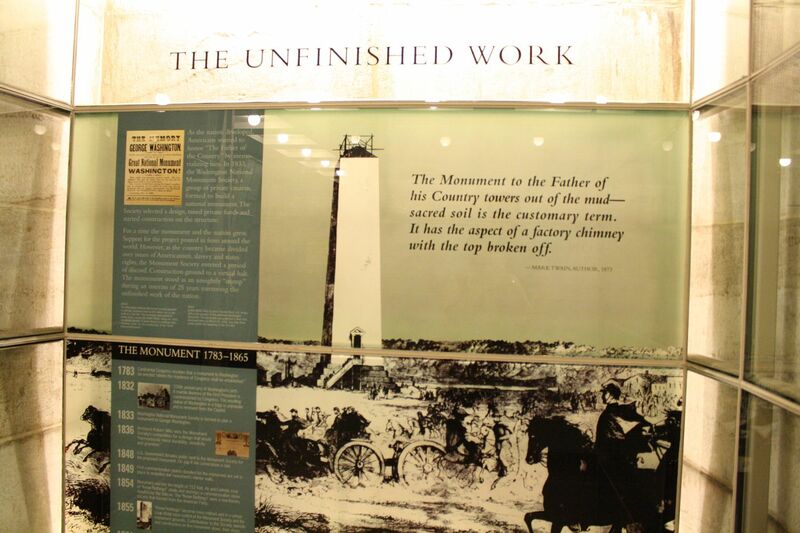 The monument underwent a big renovation not too long ago, and this area reflects the sprucing up. 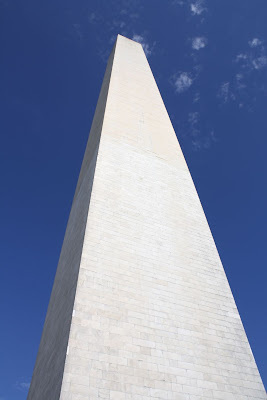 This is a replica of the aluminum tip that caps off the monument. The monument's history is interesting (I know, I know: I say that a lot. But there's a LOT of interesting history in these parts! 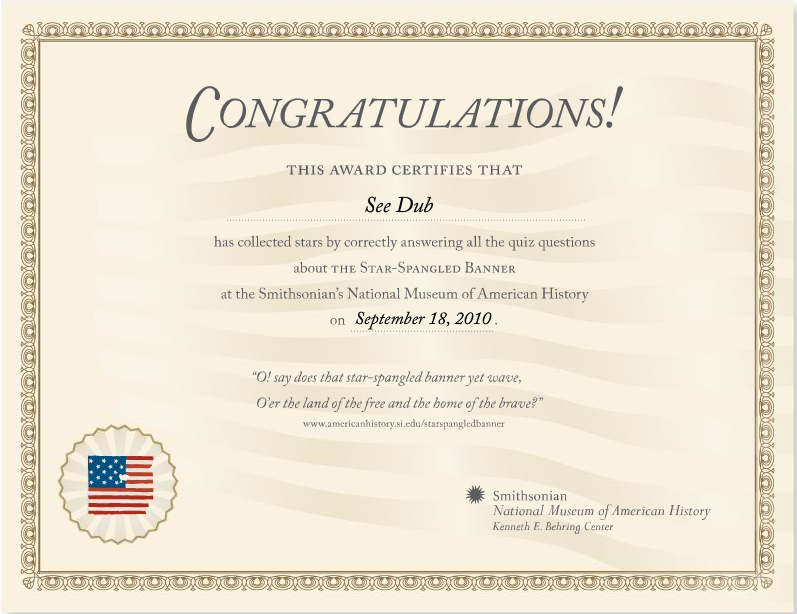 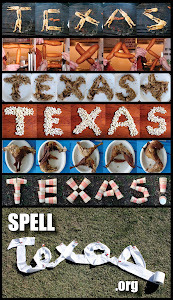 ), so we took a minute to read up on it. I had heard about how the monument had remained unfinished throughout the Civil War, which is why the stone color changes a third of the way up. But I didn't realize it was Ulysses S. Grant who pushed for the monument's completion after the war. 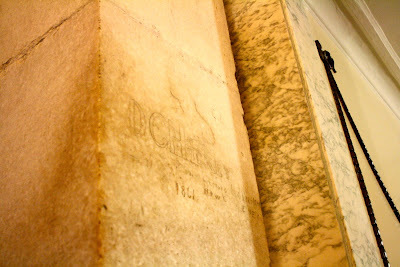 "My name is G Dub..."
On the ride down, the elevator paused a few times to let us see some of the many commemorative stones that line the interior of the monument. Then as we exited, our elevator attendant pointed out the Civil War graffiti at the ground level. Back on the ground, we took some time to marvel at the structure. 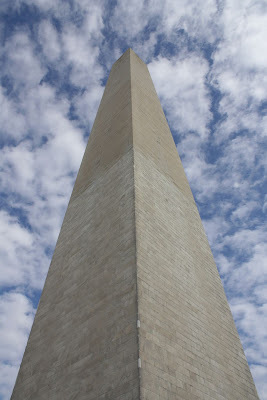 After seeing the monument in countless photos, on TV and in movies, it was an experience just to touch it! Our next appointment wasn't until 11:30, so we crossed NW 15th Street and made a quick dash into the National Museum of American History. Upon entering that Smithsonian museum, you encounter the Star-Spangled Banner exhibit. 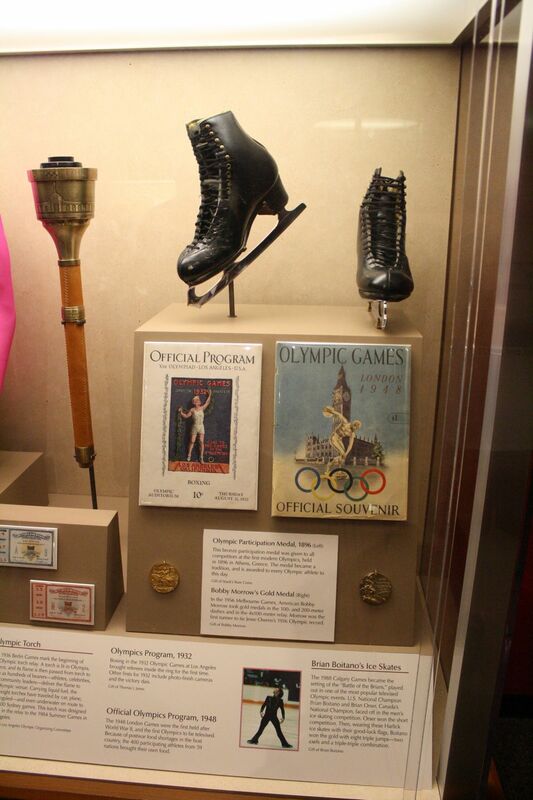 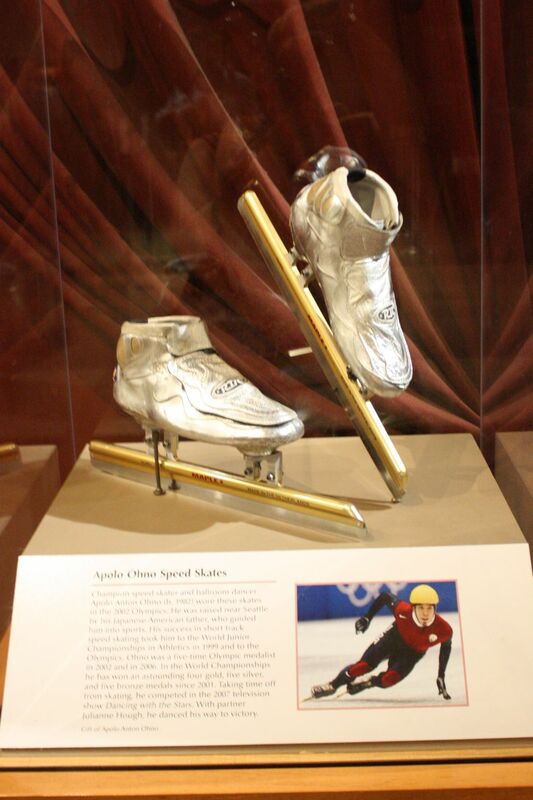 Back in the early '80s when I visited this museum, the anthem-inspiring flag was hanging in the flag room. 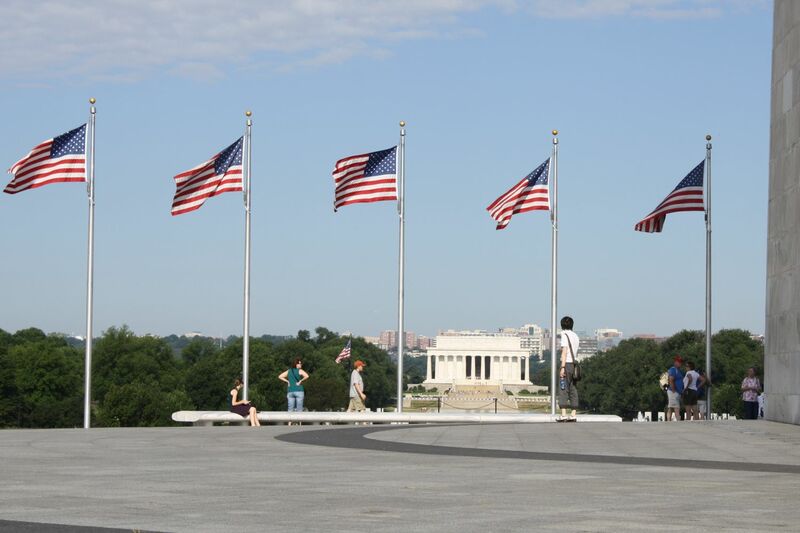 In the years since, the flag has been through a massive conservation project to preserve it. 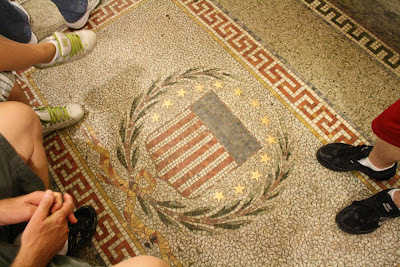 Now it's housed in a special, dimly lit room on a table that's tilted at a 10-degree angle (since that's an incline that allows visitors to see the flag but also doesn't create undue wear on it). 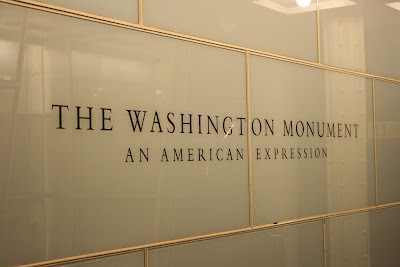 Photos were not permitted, but there's an excellent interactive tour online, complete with a look at the artifacts from the War of 1812, the Battle of Baltimore, the flag itself and the song. 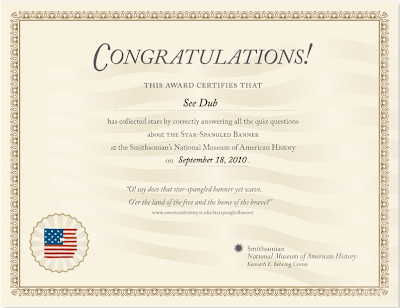 There's also an interactive quiz, and web visitors can collect all 14 stars on the Star-Spangled Banner by correctly answering questions. 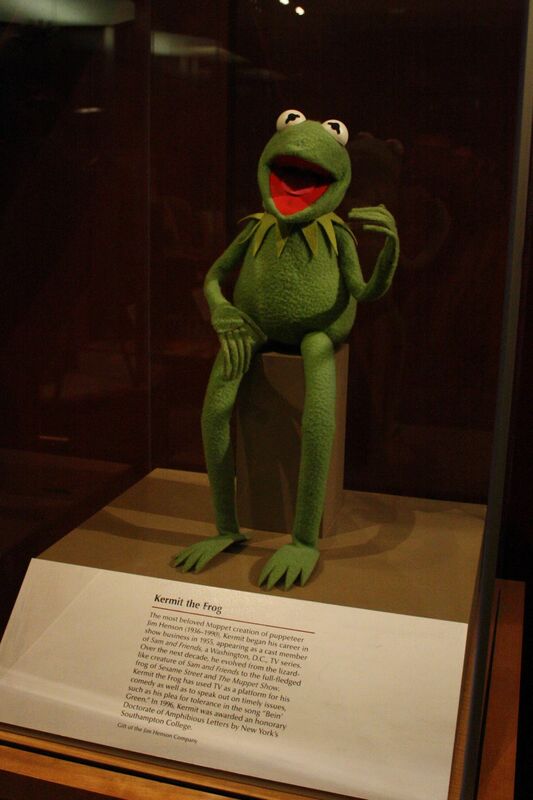 You know, if you're into that sort of thing. 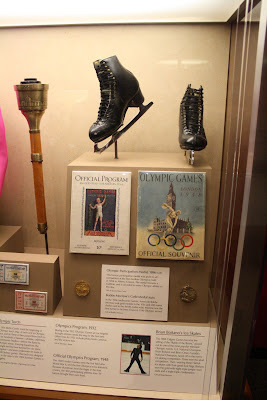 Around a corner we entered little space filled with treasures from entertainment and sports. 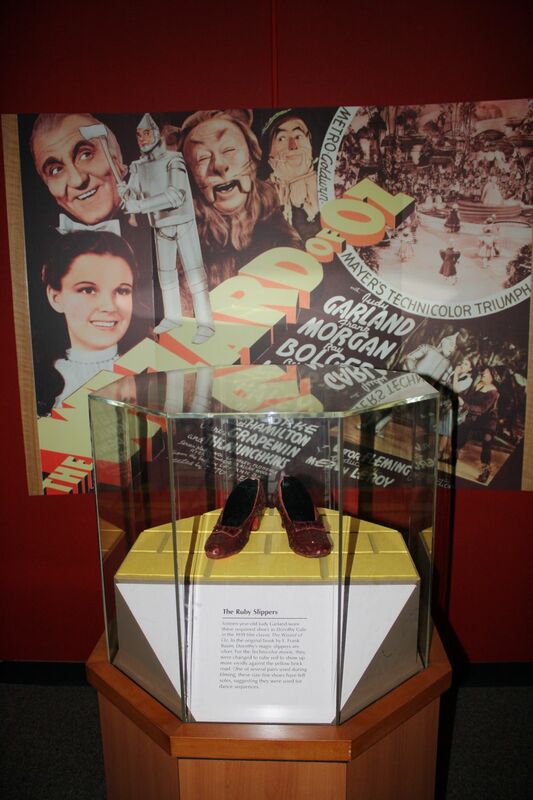 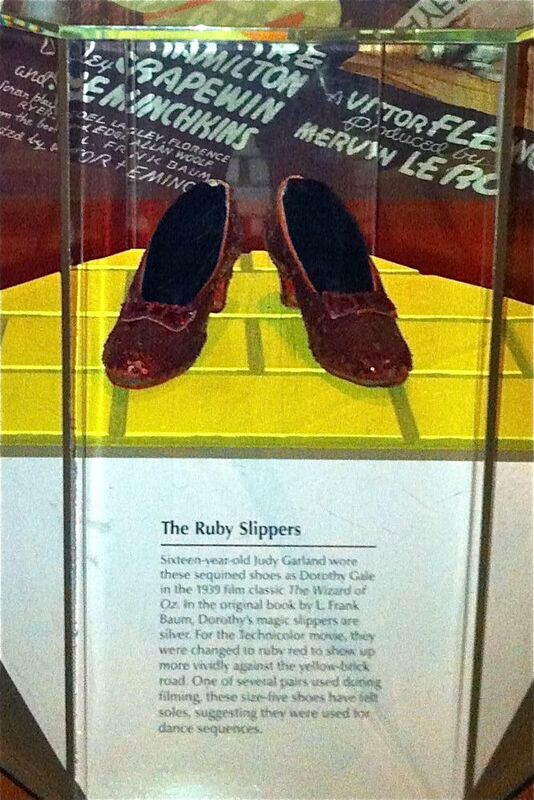 First up: the ruby slippers. 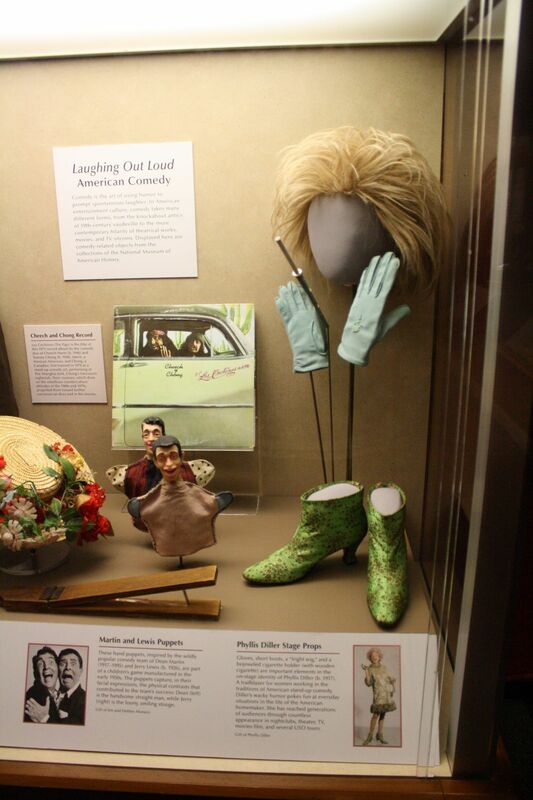 and Phyllis Diller's famous wig. 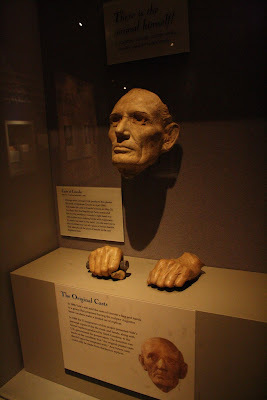 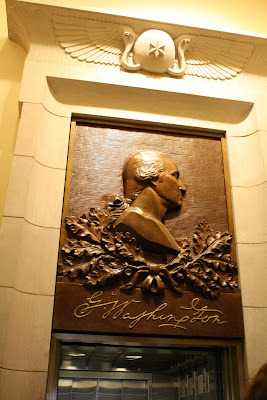 It was pretty creepy to see his face and hands from a life mask made in 1860. 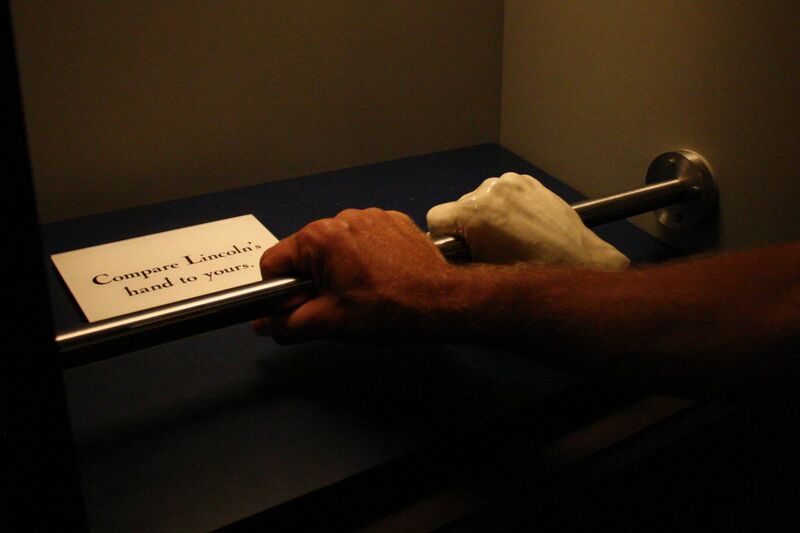 But it was neat to see how our hands compared to Lincoln's. I read online that the plaster cast was made the day after Lincoln won the presidential nomination, so his right hand was slightly swollen from all the hand-shaking! 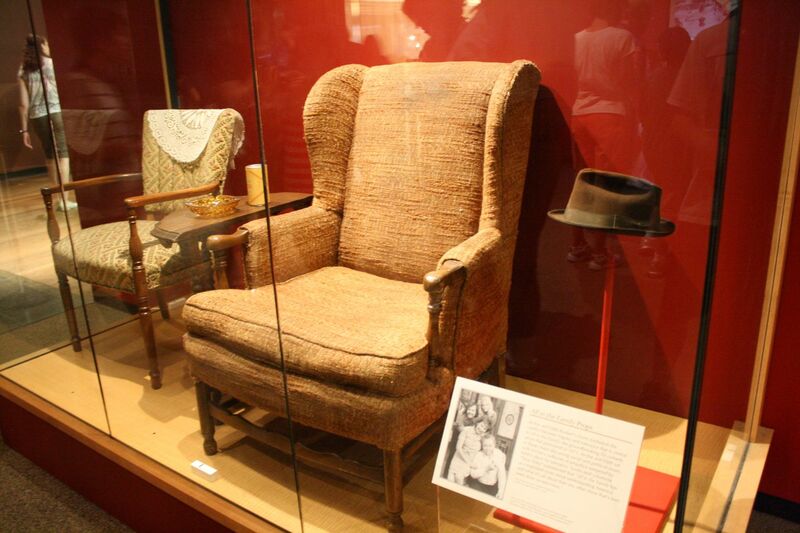 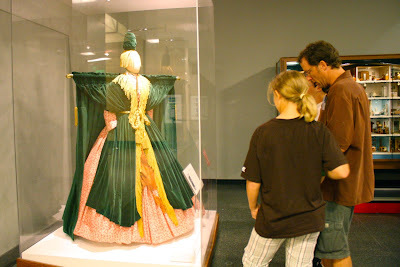 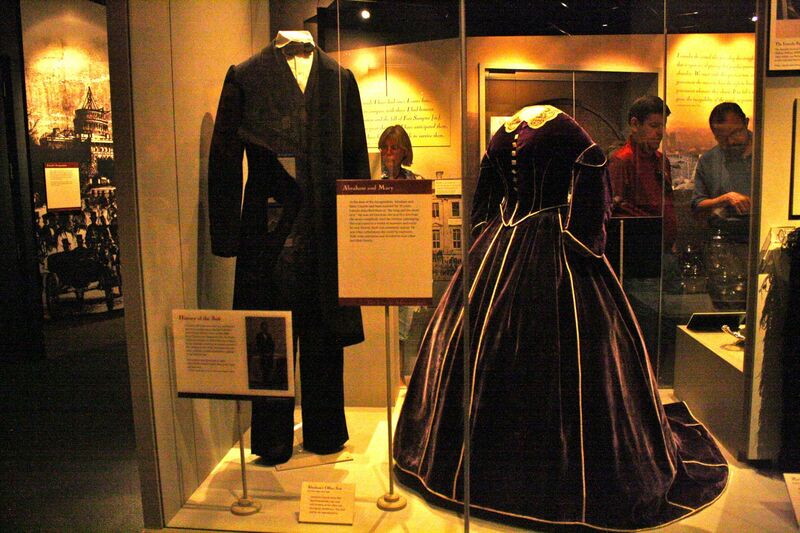 The exhibit also included President and Mrs. Lincoln's clothes. 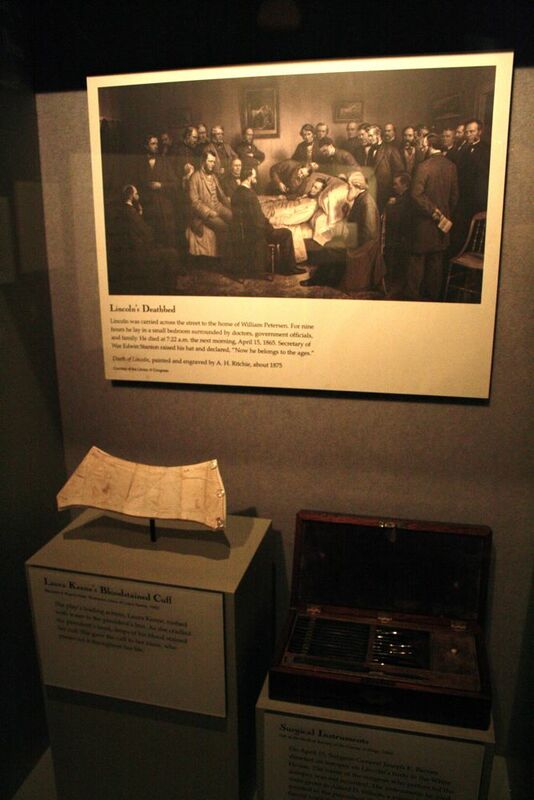 The bloodstained cuff is from one who was in the room where Lincoln died. 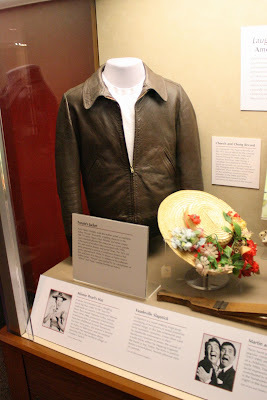 It was interesting to see pictures of the people we'd learned about during our walking tour. 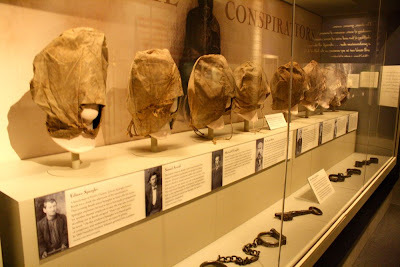 Here we could also see the hoods the Secretary of War ordered made for the prisoners to wear during their confinement. They were tied under the chin so that there was only a small opening to allow the prisoners to eat. There was much, much more to see, but we had to leave and walk back past the Washington Monument to our next destination: the United States Holocaust Memorial Museum.